54 MAY 2018 COATINGSPROMAG.COM high-pressure washer. e crew then used a hand grinder equipped with abrasive sanding discs (Tiger discs manufactured by Weiler). Once the handrails were power-tooled, Epoxy Mastic A luminum II was applied using a brush and roller. en using a low-pressure sprayer, Macropoxy 920 Pre-Prime was applied. 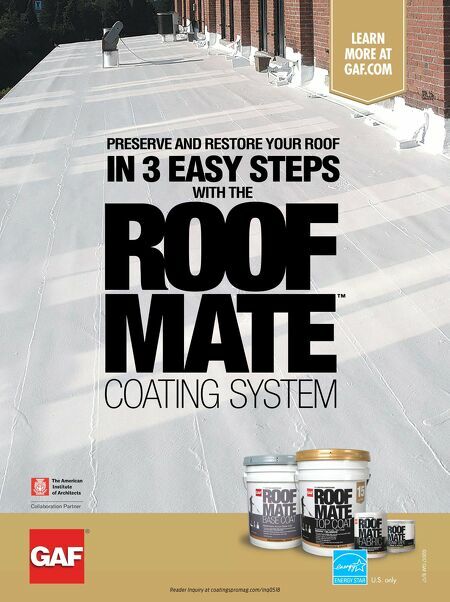 is coating is a 100 percent solids penetrating epoxy primer. e crew then applied the polyurethane finish coat. According to Skaroulis, the low-pressure sprayer was used to reduce overspray. "It should be noted that the thickness of the coating application varied due to the curvature of the handrails," explained Skaroulis. During the second mobilization, the buckle plates received the Zinc Clad III Organic Zinc-Rich Primer at an average thick- ness of 4 mils (101.6 microns). According to Skaroulis, the zinc-rich primer was the only coating needed for the buckle plates because they would be covered with rebar and concrete. ey also received a stripe coat to cover the exposed edges. Mobilization Times Two With a job of this magnitude, it isn't surprising that the Southern Road & Bridge crew had two mobilizations. However, the reason behind the distinct start and stop times is a bit surprising. "Since we stopped working during the winter months, you would think that the weather in Pittsburgh was the reason for two separate mobilizations. W hile the bitterly cold winter weather definitely encouraged the stop, there was actually more to it," said Skaroulis with a chuckle. In fact, the crew had to wait for the concrete deck to be removed before they could blast and coat the buckle plates. "e buckle plates had to be exposed in order for us to blast and prime them. Once the concrete deck was completely removed, we re-mobilized and got to work on the buckle plates," explained Skaroulis. During the second mobilization, the crew also completed any unfinished coating work, as well as spot coated the cells on the interior of the stiffening girder. 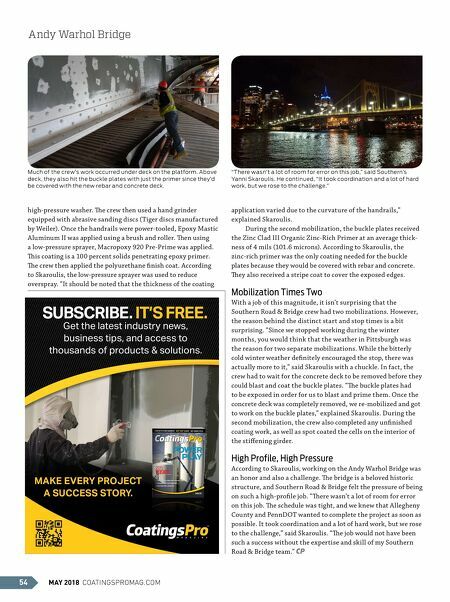 High Profile, High Pressure According to Skaroulis, working on the Andy Warhol Bridge was an honor and also a challenge. e bridge is a beloved historic structure, and Southern Road & Bridge felt the pressure of being on such a high-profile job. "ere wasn't a lot of room for error on this job. e schedule was tight, and we knew that A llegheny County and PennDOT wanted to complete the project as soon as possible. It took coordination and a lot of hard work, but we rose to the challenge," said Skaroulis. "e job would not have been such a success without the expertise and skill of my Southern Road & Bridge team." CP "There wasn't a lot of room for error on this job," said Southern's Yanni Skaroulis. He continued, "It took coordination and a lot of hard work, but we rose to the challenge." Much of the crew's work occurred under deck on the platform. Above deck, they also hit the buckle plates with just the primer since they'd be covered with the new rebar and concrete deck. Andy Warhol Bridge SUBSCRIBE. IT'S FREE. Get the latest industry news, business tips, and access to thousands of products & solutions. MAKE EVERY PROJECT A SUCCESS STORY.